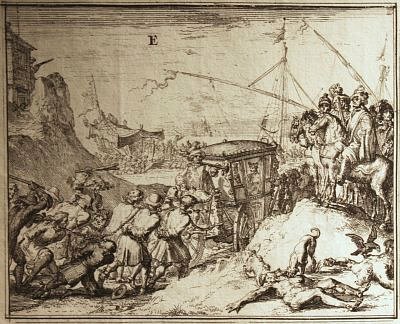 E. Huguenots, attached in twos to a chain, pulled by a coach in which Jesuits are seated. Dragoons are attacking the prisoners at the end of the procession. On the right, dogs and ravens descend on a Huguenot who has been killed by dragoons who are watching the scene from a hillock. The sea and the galleys can be perceived in the background.